Well what do you do when you have something in your mind to make and then find you do not have quite enough fabric - Improvise !! Here is a little journal I made from the fabric that Helen gave us at the recent gathering. We had to make it into something by today. 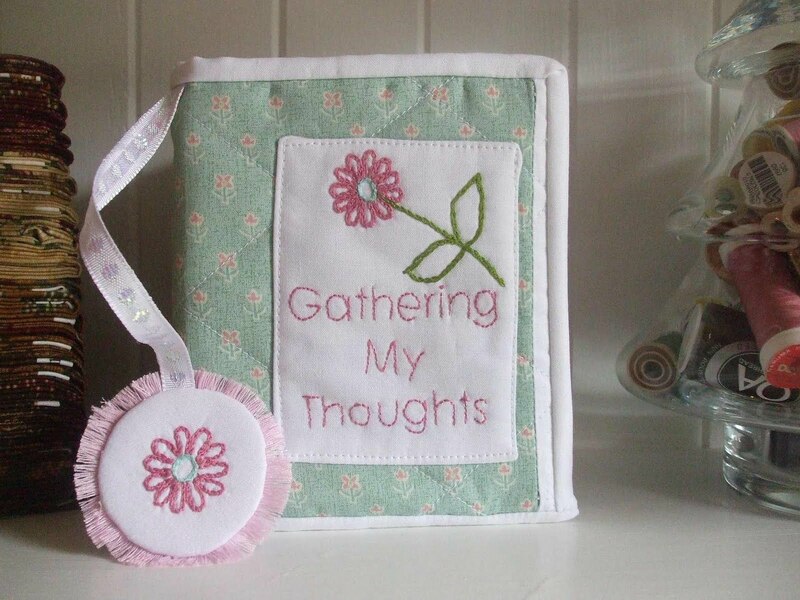 So here it is "Gathering My Thoughts" with attached bookmark - It does have a small white strip down each side as I ran out of the feature fabric but it will do just fine to write down my thoughts. This would have to be one of the laziest Easter's I have ever had - I have done nothing really but watch movies and stitch - Nothing wrong with that I suppose but having almost 1 acre of garden there is always something to do outside. 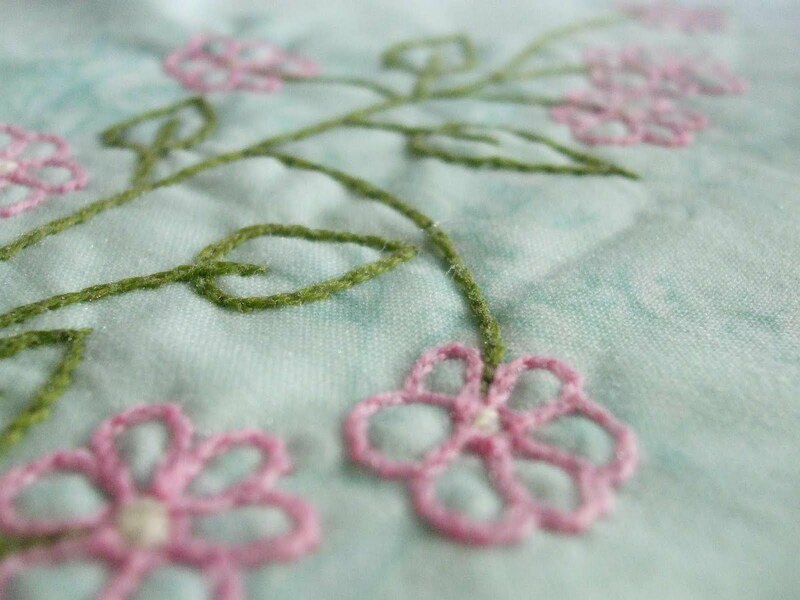 This is the stitchery featured on the doily I designed recently - I know I haven't shown you yet but I will just as soon as the pattern writing is finished. 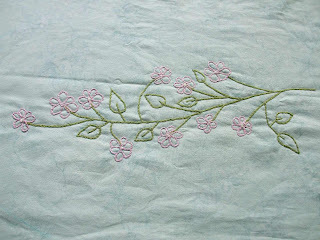 This is a pastel version of which I am making 2 - For our bed side tables. I thought I would share with you a quick side dish recipe which is another vegetable disguise used in our house a lot. 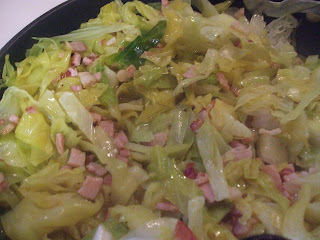 It is Curried Cabbage and Bacon. Dice up 3 rashes of bacon and fry with a little olive oil in a frying pan. Remove and place in a bowl to the side. Slice 1/4 of a large cabbage and place into the same pan. Mix 2 tablespoons of Chicken Stock powder and 2 teaspoons of curry powder with 2 cups of water mix well and add to the pan. Put a lid on the pan and simmer for 20 minutes. Stirring occassionally. 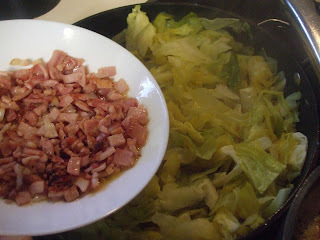 Add the bacon and simmer for a further 10 minutes and then serve as a side dish !! This is a real favourite in our household. 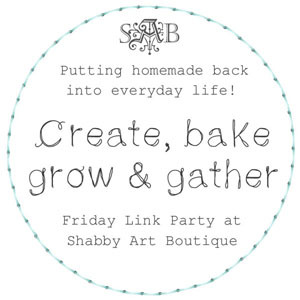 Today will be filled with housework for me and finishing off a few projects in various stages of completion. 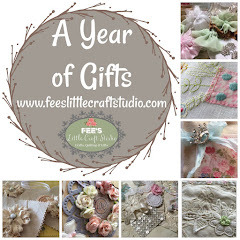 Thankyou to all of those people who created nice projects from my rabbit stitchery - The winner is MISTEA - Please e-mail me with your address details. Beautiful journal, Fiona! 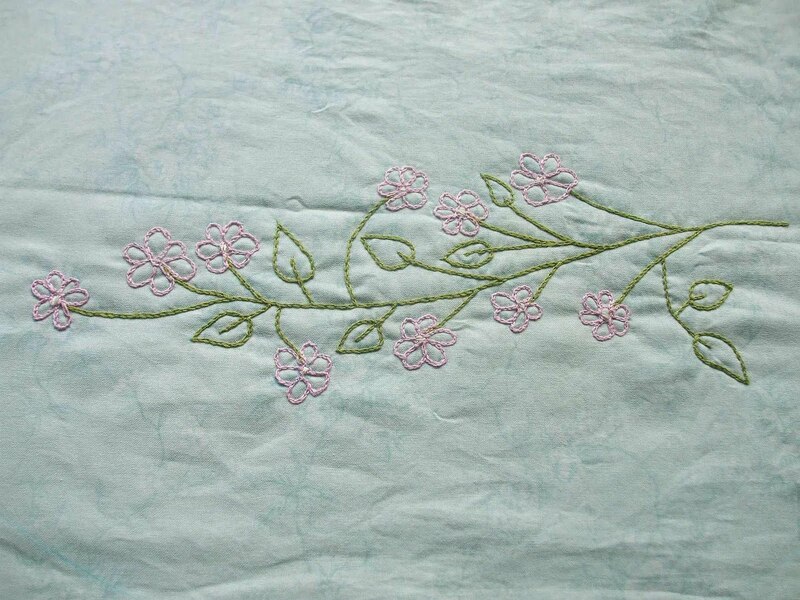 Love your stitchery, so soft and pretty. Don't overdo the housework, lol! Thats lovely! Pretty fabric too! Looks yummo! Julia and I searched your blog the other day for Chicken Wellington! I woner if it is possible to make a Recipe Index without going to too much trouble? 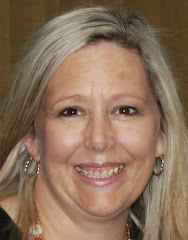 Hi Fiona...Lurline found your Chicken Wellington recipe on your blog for me...I knew I saw it somewhere, it looked so delish, and I had to make it.. Thanks for the yummy recipes..
Love your stitcheries so pretty - Gorgeous Journal cover. Thanks for choosing me as the challenge winner, the bunny was fun to embroider. Well done Fiona1! Luv the blue with the white!